This story begins with a short, slanderous political attack by one writer, and continues with a lengthy rebuttal by another--a self-appointed target who took it upon himself to respond in kind: in verse. Written in 1944 in response to Soviet Armenian writer Gevorg Abov's «Մենք չենք մոռացել» ("Menk chenk moratsel," "We Have Not Forgotten"), and published the following year, «Թուղթ առ Երեւան» (Tught ar Yerevan, Letter to Yerevan) made Tzarukian a prominent voice in the Armenian Diaspora almost overnight--from the Middle East to Europe and the Americas.The poem was republished more than a dozen times in various Armenian communities--including in Syria, the United States, Lebanon, and Cyprus--up until the early 1990s, and as a result became a source of inspiration for tens of thousands. Published by the 120-year-old Hairenik Press, this is the first English translation of Tzarukian's Letter to Yerevan. 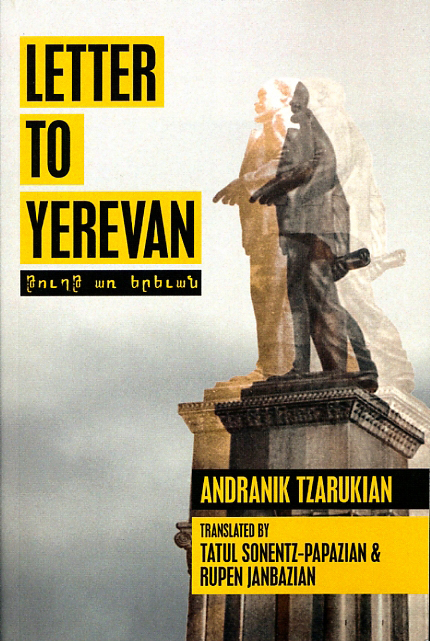 The translation was a collaborative effort between the former director of the ARF and First Republic of Armenia Archives and former editor of the Armenian Review Tatul Sonentz-Papazian and former editor of the Armenian Weekly Rupen Janbazian. It features an in-depth introduction by another former editor of the Armenian Weekly and the volume's English editor, Vahe Habeshian, as well as six original illustrations by Yerevan-based artist Meruzhan Khachatryan. The Armenian language republication was edited by Yeprem Tokjian of Toronto. The publication of Letter to Yerevan is the first of several initiatives planned celebrating the 120th anniversary of the Hairenik Association. All the proceeds from book sales will be donated to the Hairenik Association's Newspaper Digitization Project.